We were eight sopping-wet students in the pouring rain, but our optimism could not be shaken. 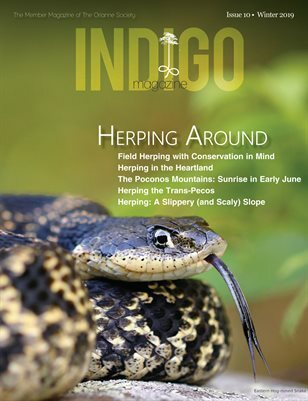 There was something in the air, and everyone was eagerly anticipating what a weekend at the Orianne Indigo Snake Preserve (OISP) would yield. Ben Stegenga, our herpetology professor at Southern Wesleyan University, was itching to get on the road, but not before he wrapped up the final details of the trip—making sure everyone had the correct attire, field tools and basic necessities one would need for the weekend. After everything was squared away, we hopped in the van. The ride down to Telfair County, Georgia, was mostly uneventful with the exception of a Common Snapping Turtle that we rescued from a busy highway. It took us about four hours to reach the preserve, and as we entered the OISP, Chance Feimster, an Orianne Society member and a friend of Professor Stegenga, caught a glimpse of a beautiful cornsnake. Chance boomed out of the vehicle and within seconds had the snake in hand. We hadn’t been on the preserve for more than a minute, and we had found our first snake! My expectations for this weekend had just been affirmed. Upon our arrival we met Kevin Stohlgren, Orianne’s Assistant Conservation Scientist, and he led us to our housing for the weekend. Earlier that day, the weather had been temperamental with a mix of sunny and gray skies, but as we entered the driveway, the weather decided it had a purpose. The strong winds, roaring thunder and erratic lightning of the storm postponed our first outing of the weekend, but when the clock struck midnight, the weather gave us some more favorable herping conditions. Even though there was a chance of violent weather sneaking up on us out in the field, we decided that it was worth the risk. We packed up the van with dip nets and flashlights and headed back to the preserve to explore a wetland for frogs and snakes. On the trail we saw several Eastern Spadefoots, Southern Toads and Eastern Narrowmouth Toads that had been brought out by the rain. In the distance you could hear a chorus of Barking Treefrogs, Southern Cricket Frogs and Green Treefrogs all competing for a chance to get lucky with their female counterparts. We encircled the pond, finding a plethora of the frogs that we had heard on the hike in, but we also discovered several Central Newts, a juvenile Banded Watersnake that was in shed and a juvenile American Alligator. The alligator’s presence heightened our senses and made some of us wary while wading in the water. However, one of my fellow classmates, Nathan Stegenga, sought out the alligator; moving slow and steady with the beam of his headlamp fixed on the gator up until the moment he grabbed it. I was unaware of this incident occurring until I heard Nathan’s shout of celebration. Most of us were on the other side of the pond, but after the exclamation, we rushed down the prickly pear bordered trail to reach him. Upon seeing Nathan, you could describe his expression as someone who had just won the lottery, and his beaming grin was evidence. At this point the rain had started to pour, but that did not stop our professor from documenting this momentous experience. Once the class had a chance to touch the alligator and pictures were taken, it was time to head back to the house and get dry. The following morning came early along with the sanguinity that overflowed from the night before. We began the day by sifting through some ephemeral wetlands with our dip nets, finding several species of frogs and larvae. Thirty minutes later we ushered ourselves into the woods to flip rocks and logs but made sure to return them to their original setting after we had revealed their treasures. Shortly after we uncovered a Slimy Salamander, the infamous Dirk Stevenson showed up with his cap cocked slightly to the side and a contagious smile on his face. He greeted us, and once we restarted our herping endeavors, he walked with an unequaled zeal when compared to the rest of the group. Some of the highlights from this area included a cotton mouse (which many sadly mistook for “Cottonmouth” when Dirk called it out), a Florida Redbelly Snake and a Rough Earthsnake. We made our way to some turtle traps that we hoped would contain the elusive Spotted Turtle, but it wasn’t meant to be. The turtle traps may have been empty, but Marbled Salamander larvae and a variety of tadpoles were numerous. Kevin even managed to catch an Eastern Mud Turtle by hand. Despite the ever-present buzzing of mosquitoes, relentless in their quest for our blood, we continued on. Wading knee deep in the pools, we discovered species most of us have never seen before. Exiting the wetlands, our purpose was now checking Gopher Tortoise burrows and flipping tin in search of snakes. Hope was high for snakes, and the increasing temperature was sure to bring them out of their hiding places. We scrounged up an Eastern Fence Lizard and several Southeastern Five-Lined Skinks under the tin when all of a sudden we hear Dirk yell, “Do you guys want to see an Indigo Snake?” We had to ask ourselves twice to see if we heard him right before we sprinted over to the origin of Dirk’s voice. There among the Wiregrass on the apron of a Gopher Tortoise burrow laid a five-foot female Eastern Indigo Snake. She appeared to be a little thin, and patches of her scales displayed the telltale blisters from a winter spent in tortoise burrows. Nonetheless, she was a sleek black serpent with a chin adorned in fire-engine red. We were in awe. We took her back to the vehicles to take data on her size, weight and body condition. After checking for a PIT tag, Kevin and Dirk realized that this female had been previously tagged years ago as a juvenile and seemed to be gravid. It was encouraging news for the future of the Eastern Indigo Snakes on the preserve. As a couple of students went to release the Indigo, Nathan peered into a nearby burrow, and to his surprise, there was a Gopher Tortoise peering back at him only feet away! Kevin was able to pull the tortoise out of the burrow to show the class. We passed the shy reptile around, snapped some pictures and then returned her to her abode. After releasing the tortoise, Dirk suggested that we drive down to the river and neighboring swampland to search for watersnakes and amphibians. We were greeted by thick clouds of buzzing blood-suckers, so we applied some more repellent before striking out. Kevin and a few of us set some turtle traps along the river’s shore in hopes that we would catch some Loggerhead Musk Turtles the next morning. We then ventured upstream scanning the shore and overhanging branches for basking Nerodia. After only a couple minutes, we captured a small skink, and upon close inspection, it was identified as a Five-lined Skink, the very first of its species documented on the preserve! After releasing our find, we came to some small isolated pools nested among the cypress trees. As Dirk stepped into the first pool, he slipped on the muddy bank and fell into the water. In typical Dirk fashion, he played it off by immediately searching through the submerged leaf litter that he landed in. Within seconds he had uncovered a Lesser Siren! That was the first of several that we would find in the next half hour. Dirk and Professor Stegenga waded out further into the water to search through leaf litter on the opposite banks. After a few minutes they had discovered a baby Two-toed Amphiuma! The class rushed over to aid in the search, and we revealed about half a dozen more of the slippery amphibians. This was also the first time this species had been documented on the preserve! Despite our good luck, the clouds of mosquitoes were wearing on the group’s morale, so we headed back to the safety of our vehicles. Delighted in the fact that we escaped the mosquitoes at the swamp, Kevin and Dirk decided to take us to another section of sandhills to flip more tin and cover boards. Skinks continued to be plentiful, but it seemed as if we weren’t going to find any more snakes. But as Dirk flipped one of the last pieces of cover, a Southeastern Crowned Snake was revealed. The petite snake tried to escape the hands of the alien giants that held it, but it eventually calmed down for pictures to be taken. It was getting late, and we were about to return to the house; drained and anxious to get a nap in before evening road cruising, I was walking near the front of the group. Woken up by an ambiguous shout in the distance, I turned around only to see Professor Stegenga and Chance Feimster diving for something. The ambiguity disappeared when I saw that what they had so fervently pursued was an Eastern Coachwhip! The markings on this creature were stunning—large eyes with a dark brown coloration that eventually faded into a lighter, golden brown. He was about six feet, and as Chance was taking pictures, it exhibited their unique periscoping behavior. It was a good find to end on before taking a hiatus. Professor Stegenga made the road cruising outing optional, but everyone in our class, as tired as we were, was eager to find more herps. Shortly after we started down the highway, we spotted a cornsnake which was surprisingly feisty, striking at its captors with an unpredictable rhythm. We assisted two more snakes (a Peninsula Ribbonsnake and Eastern Gartersnake) off the road before stopping at a bridge to look for calling treefrogs and Rough Greensnakes in the overhanging trees. Although we did not see any snakes, Nathan and Chance found an overabundance of Cope’s Gray Treefrogs along the stream below the bridge. After road cruising, we decided to head back to the pond we had visited the previous night. The Barking Treefrogs were still calling their hearts out, and we spied our alligator friend but he was much more wary of our presence this time. Gibson Donald, another student, caught a juvenile Banded Watersnake that was out foraging along the pond’s edge. She was delighted, as this was the first snake she had ever caught. The little snake had been successful in its foraging because after a little handling, it regurgitated a Southern Cricket Frog. A second bulge could be seen in its belly, so we quickly released it to ensure it wouldn’t lose the rest of its meal. Other highlights were several pairs of Barking Treefrogs and Southern Cricket Frogs in amplexus and an unusually docile adult Banded Watersnake. After an hour of herping, we were all exhausted and decided to call it a night. The next morning Kevin took us out to check the turtle traps we had set the previous day and to look for the elusive Crotalus adamanteus. We saw a lot more Gopher Tortoises in their burrows and a couple Fence Lizards, but the turtle traps were empty and the Eastern Diamondbacks eluded us. We may not have found anything new the morning of our departure, but it had been a pleasure to work in the field alongside The Orianne Society. With a total of 37 species logged, the weekend could not be considered anything less than a success. Before we left, our class lined up in front of the OISP sign for a final class photo. It was truly a privilege to be on land that The Orianne Society has set aside and to interact with the very species they aim to protect. This experience with The Orianne Society gave me a new perspective on wildlife conservation that I did not have before the trip, and for that, I am grateful.